As Shakespeare's First Folio nears the end of its visit to Emory, two events on Dec. 5 celebrate the Bard's legacy, including a lecture by the director of the Folger Shakespeare Library and an evening with poets Natasha Trethewey, Kevin Young and Jericho Brown. The First Folio exhibit closes Dec. 11. As Shakespeare's First Folio nears the end of its visit to Emory, two events on Monday, Dec. 5, will celebrate the Bard's legacy in print and poetry. Published in 1623, just seven years after Shakespeare's death, the First Folio is the first collected edition of the acclaimed author’s plays and is among the most famous books in the world. Emory is the only Georgia site chosen to display the literary treasure as part of "First Folio! The Book that Gave Us Shakespeare," a national traveling exhibit from the Folger Shakespeare Library, which is coordinating displays in all 50 states to commemorate the 400th anniversary of the Bard's death. The Emory exhibit, which opened Nov. 5, continues through Dec. 11 in the Michael C. Carlos Museum. Closing festivities for the First Folio are set for Dec. 5, with two opportunities to explore Shakespeare's impact. Michael Witmore, director of the Folger Shakespeare Library, presents "The Wonder of Will" at 4 p.m. in the Carlos Museum's Ackerman Hall. Witmore will discuss the legacy of Shakespeare and the Folger’s extensive collection of the Bard in print. 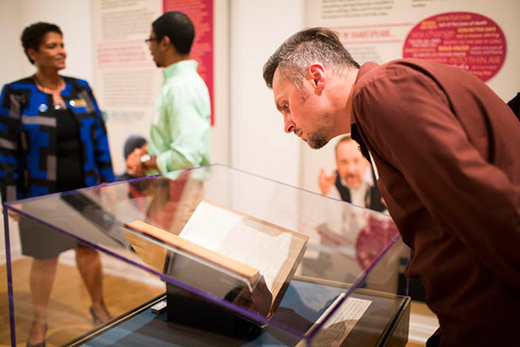 The First Folio exhibition gallery will also be open from 3-7 p.m.
That evening, the last of Shakespeare at Emory's events while the First Folio is on campus, "The Bard and Poetry," will feature former U.S. Poet Laureate Natasha Trethewey and award-winning poets Kevin Young and Jericho Brown. The event begins at 7 p.m., also in Ackerman Hall. Natasha Trethewey, Robert W. Woodruff Professor of English and Creative Writing and director of Emory's creative writing program, was appointed United States Poet Laureate in 2012 and again in 2014. She won the 2007 Pulitzer Prize in Poetry for her 2006 collection "Native Guard," and served as poet laureate of Mississippi from 2012 to 2016. Kevin Young, who has served as Emory's Charles Howard Candler Professor of Creative Writing and English and curator of literary collections and the Raymond Danowski Poetry Library, will become director of the Schomburg Center for Research in Black Culture starting in December. His most recent book, "Blue Laws: Selected & Uncollected Poems 1995-2015," was longlisted for the National Book Award. Jericho Brown, associate professor of creative writing, is the recipient of a Whiting Writers Award and fellowships from the John Simon Guggenheim Foundation, the Radcliffe Institute for Advanced Study at Harvard University and the National Endowment for the Arts. His first book, "Please," won the American Book Award and his second book, "The New Testament," won the Anisfield-Wolf Book Award.